Now that all the euphoria from announcing your engagement has quieted a bit, you and your fiance need to sit down and push pencils as you plan out all the details of your wedding day. Setting the budget and keeping to it will be a challenge, but it is a challenge you can surmount together. This may come as a surprise to most couples planning their weddings -- the wedding cake may well be one of the most expensive items for the wedding ceremony even though it consumes only a small area space in the reception. Since it is the iconic centerpiece of the occasion, the wedding cake can be considered a "necessary evil" in this once in a lifetime event. If we are going to dole out a significant amount for a wedding cake, we expect it to be not just beautiful but delicious as well. Why do wedding cakes cost so much? As a rule of thumb, the larger the cake, the higher the cost. Size takes into consideration two things-- weight and layers. Stacking cakes into layers require serious skill and talent. It is a fine art. 2. The kind of cake batter you choose will determine the price. Are sponge cakes acceptable to you or would you prefer heavier cake batters which come with a heftier price tag? Expect the cost to go up with a fancier frosting. Butter cream frosting is one of your most affordable options in this criterion. However, it does not do well in heat. It is best to consider your venue in deciding the frosting you will use for your wedding cake. More elaborate designs require greater skill and artistry. It is, after all, a work of art. Hence, the price tag associated with it. 1. Use a different cake shape. Do away with the traditional round cake and opt for a square one! It yields more slices and feeds more guests. Using a square wedding cake can actually be a unique modern statement! 2. Use fresh fruits and flowers. Elegance does not mean elaborate. In fact, elegance in modern days has become synonymous to "minimalist". Choose a clean design and add simple patterns to adorn the cake such as bows or polka dots. 4. Enlist the services of a home baker. If you have friends who know how to bake or are private home bakers, ordering your cake from them may offer you many advantages. First, private home bakers have a reputation of having secret recipes that are delicious. Second, you can be sure of getting a lower price from private home bakers than from business bakeshops. Lastly, your wedding cake will most likely have more "cake to eat" - you will have more to bite, so to speak. 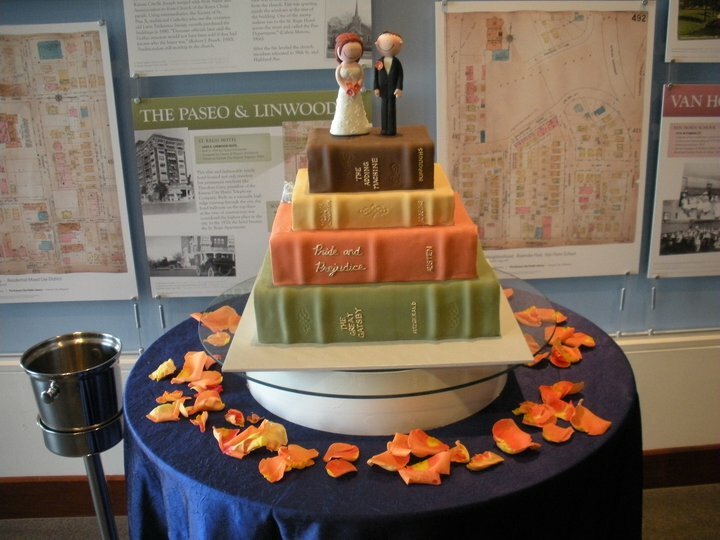 A recent wedding was featured in a website highlighting the wedding "cake" used in their reception. It was made of books (that the couple loved reading), arranged in tiers. The topper they used was a typical bride and groom figurine. Small cupcakes were scattered around the table where the "book arrangement" lay. That "piece of cake" was indeed the talk of the town that night. So dare to be artsy for it pays to be creative!